Learn to develop robust and scalable Data Science solutions that can be taken into production easily. Organizations need to adapt to change more effectively. For this, they require Data Scientists that can not only develop statistical models that predict future events, but can take these models into production as well. Our skilled trainers have world-class knowledge and years of experience in the field of Big Data and Data Science. GoDataDriven’s training curriculum enables professionals to escalate their Data Science skills to the next level. Whether you are new to the Data Science scene and want to learn how to develop models with R, Python or Spark, or you are an experienced Data Scientist interested in broadening and deepening your skill set; GoDataDriven offers a complete package of high-quality training. Our data specialists look forward to share their expertise. 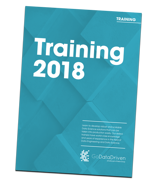 Download the brochure - GoDataDriven Training 2018!